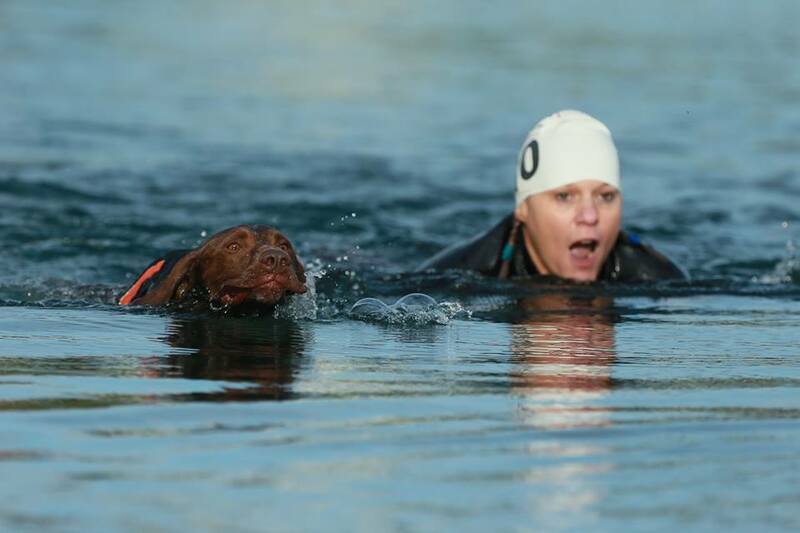 80 meter swim with your dog from bank to bank in a lake! then run to the transition area using a stake out line for your dog, change for the bike section. 2.5 kilometer Biking section ( Bikejor, which is cross-country biking with your dog attached to your bike) around thelake, including some woodland and hills. Back to transition stakeout and prepare to run. All elements should be completed with the same dog who must be over 18 months old as this sport is physically tough for the dog. Distances are short for this reason and to make sure you can concentrate on safety for your dog. Lifejackets or bouyancy aids are optional for dog and handler, some dogs being natural swimmers and not requiring a lifejacket. Marshalls are present on the banks of the lake and in the centre and a safety kayak is present. You can climb out at any time if you need. Not all dogs can or want to swim so they must be introduced gradually to see if they like it. 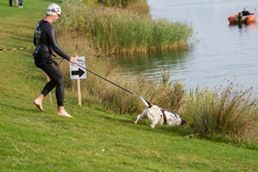 The race starts on the bank of the lake with you ready to swim and finishes at the end of the canicross, the race time includes the transitions, so you need to be quick and calm in the transition area and not get your wetsuit in a knot! It is interesting to see the dogs at transition, watching their handlers and waiting for the next instruction and the bond between dog and handler is apparent.The race is chip-timed and there is a photographer on course to catch your proud moments! ( Take 2 Event Photos Gary Dovell who is excellent at these action shots). Only one dog per handler can take part so that you can concentrate on your dog in the water for safety. Wetsuits are mandatory for the handler because of the cold and to protect you from dog scratches if the dog becomes nervous or fancies hitching a ride.Those who dont fancy a swim can take part in a team event and just do the bike or canicross element. There is also a duathlon with just running and bikejor, no swimming. Events are May Day Bank Holiday and September. The September option means warmer water hopefully. There are prizes and Rosettes donated by ” Arctic Wolf” and there are spot prizes for things like calmness in transition and bond with dog. 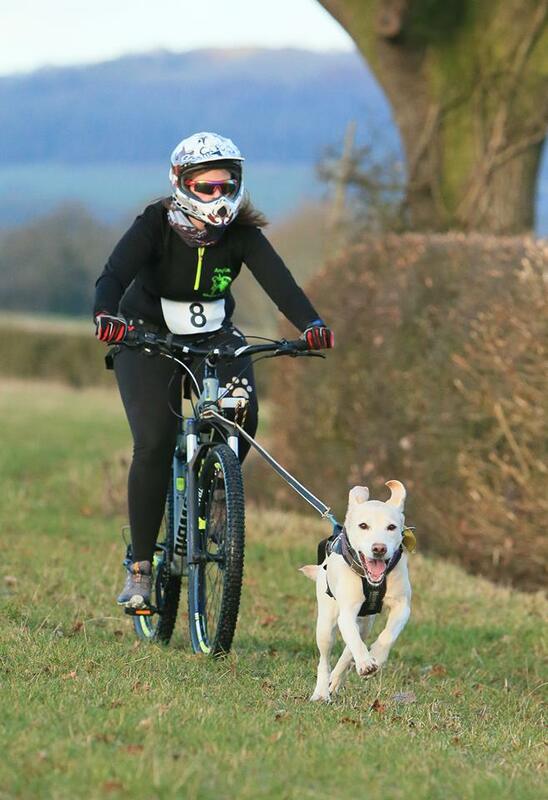 Basic canicross training is a must before the other disciplines are attempted! Voice commands must be practiced for canicross such as left, right, steady, go on. The dog must be happily running out in front and listening and reacting to commands. Bike training is more complicated… the dogs runs out in front of the bike and this is where commands must be given clearly and understood, you will be travelling faster and more can go awry! You must have your commands nailed! Swimming is distracting for the dog, they dont seem to hear and understand as clearly in water. This is where strong commands are useful and the well-trained happy dog will actually pull the handler along whilst swimming in the direction instructed. It is worth joining a local canicross group to do some social runs and finding out the locations of open water lakes where dog swimming is permitted. It is safer to try this with other people around. Summer swimming is a good alternative to running when the temperatures are too hot for running with the dog. Watch for warnings of blue-green algae in lakes in the Summer as drinking this can be extremely toxic and even fatal for a dog. Equipment for these sports can be obtained from K9Trailtime. A comfy harness for the dog is most important, a bungee line to negate the jolting when the dog pulls and a waist/hip belt for running for the handler. A bike attachment helps stop the line getting tangled in the wheel if the dog stops or drops back. A normal “hardtail” Mountain Bike with front suspension is best, suspension is needed to cope with the bumpy trails. Light weight bikes are better but more expensive. The next event is May Day Bank Holiday weekend at box End Park, Bedfordshire. More information is available at ” TriDog Events” Website and ” TriDog” Facebook page. Good luck to all competitors and dogs! You can enter online, 20% of the entry fee goes to charity, a different Charity and different medal each month. You can choose 5k,10k any distance or Half Marathon. You can run locally at a time to suit you, record the run on an App. on your mobile phone or use a running watch and take a photo of the readings. Send proof of the run to the organisers who enter you on their league table and send out your medal. The virtual races are great for those with nervous dogs or just starting out in canicross, who may not want to enter a race situation, which can be more stressfull on dog and owner! This way you can still race and earn your medal, whilst donating to good causes. Our canicross training with our lovely Hamiltonstovare, Dexter, is going better. Dexter’s Kennel name is Flixtonia Come Fly with Me… very apt! He is getting better at passing dogs whilst running straight and is now keeping going having overtaken another dog.Beware the “G” Force if he spots a deer in the woods, he takes off like a jet.. We are trying to keep our training and commands consistent and Dexter clearly wants to please us and for everyone to be happy.